Occupational therapists specialize in designing and implementing interventions to maximize client success. OT’s are trained in the science and the art of analyzing an activity, changing it up to make it a “just right challenge” based on a client’s interests and his or her individual area of need, and making use of the activity as a highly effective therapeutic tool in a clinical setting. *Meaningful, purposeful activities are much more effective to use as a means to improve client performance. Whenever possible, substituting a simulated situation for the actual one in which the client will perform should be avoided. 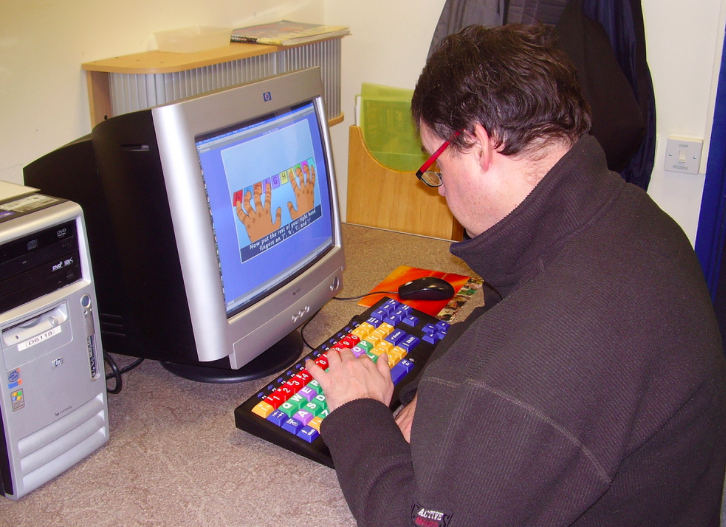 For example, working with a student who is learning letter location in keyboarding will have much more of an impact on his performance if a keyboard and a monitor are used, rather than a mock set-up in which a keyboard the only thing used or – even less desirable – a picture of a keyboard is used for an input source. *There is a difference between grading an activity and adapting an activity; this is an important distinction because it affects how the task to be addressed is set up, how the information is presented to the person with a disability, and what the goal is with regards to the task. *In the school system, the term modification is often used to when in lieu of gradation, while the word accommodation is frequently used instead of the term adaption. (Note: when it comes to adapting an activity, the word grading is used in a different context than it usually is in the school setting – it doesn’t have anything to do with earning an A or a B in this context.) When a student’s IEP calls for a modification to the curriculum, the child is taught and/or tested on something different than his peers. When the IEP lists accommodations that are to be allowed for a student, the child is taught and is tested on the same material as his peers but may use alternate materials and/or strategies to take in or output information. Example of A.T. used as a modification – The student uses a word processing device to type vocabulary words in designated spaces in lieu of writing sentences using the word list. Example of A.T. used as an accommodation – The student uses a word processing device to type sentences using the list of vocabulary words as assigned instead of writing on paper. *Activity grading refers to changing the activity by adjusting the complexity of what is to be performed. This strategy is used to help improve a person’s performance level. The process involves analyzing an activity and then using clinical reasoning to decide what parts of the task are appropriate to expect the client to perform, thus providing him or her with an opportunity for gradual improvement in occupational performance. The most effective use of gradation enhances client performance in selected increments, providing the just right challenge for the client based on his or her present level of abilities. “As a general rule, an activity should be graded up when the patient is able to accomplish the task and further progress is desired, or graded down when the patient is having difficulty with performance” (Levine & Brayley, 1991, p. 610). “Grading activities challenges the patient’s ability by progressively changing the process, tools, materials, or environment of a given activity to gradually increase or decrease performance demands. These incremental modifications are made in response to the individual’s dynamic changes and provide opportunities for gradual development of skill and related therapeutic benefits” (AOTA, 1993). *Appropriately grading an activity sets the stage for a client to succeed. In addition, it allows for clear documentation of client progress. Another aspect of grading is looking at where occupational therapy intervention should begin. Through observing a client’s performance in functional tasks, the therapist can identify specific challenges that can then be addressed as part of the intervention. *Adapting an activity refers modifying or substituting objects used in performing the activity; changing a task to make it easier to complete. In many ways, “the main goal of OT intervention is to facilitate the client’s adaptive responses to promote health and wellbeing” (Hersch, Lamport, & Coffey, 2005, p. 65). Adaptation may involve changing the tool or the technique used to complete a task. It is important to note that, although adapting may involve making changes to an activity to make the task possible for a client according to his abilities, adaptation does not change the outcome of the activity. “Therapeutic adaptations refer to the design and/or restructuring of the physical environment to assist self-care, work and play/leisure performance. This includes selecting, obtaining, fitting and fabricating equipment, and instructing the client, family and/or staff in proper use and care of equipment. It also includes minor repair and modification for correct fit, position, or use” (AOTA, 1979). *In some cases, the use of adaptation may conflict with the beliefs or motivation of a client; he or she may see the purpose of an activity or the meaning of accomplishing the task as more important than the ease or efficiency of getting it done. As in all interventions, the context in which the client performs is a vital part of knowing when an adaptation is needed and, if so, what is most appropriate to use with a specific client. *There is often a choice between fabricating an adaptation and buying a commercial product. Cost-effectiveness of using clinic time/materials, availability of a product on the market, reimbursement, safety, liability, and other factors as well as experience and knowledge of the practitioner and preferences of the client will enter into these decisions. *In addition to grading and adapting therapeutic activities used in intervention, a therapist also needs to be able to grade and adapt his or her own behavior to meet a client’s needs, including health status, time constraints, resources available, and industry standards. In essence, the practitioner must demonstrate adapted behaviors in order to best facilitate adaptive responses in a client’s occupational performance. American Occupational Therapy Association. (1979). Uniform terminology for reporting occupational therapy services. Rockville, MD: Author. American Occupational Therapy Association. (1993). Position paper: Purposeful activity. American Journal of Occupational Therapy, 47, 1081-1082. Hersch, G. I., Lamport, N. K., & Coffey, M. S. (2005). Activity analysis: application to occupation, 5th ed. Thorofare, NJ: SLACK, Inc.
Levine, R. E., & Brayley, C. R. (1991). Occupation as a therapeutic medium: A contextual approach to performance interaction. In C. Christiansen & C. Baum (Eds. ), Occupational therapy: Overcoming human performance deficits (pp. 591-631). Thorofare, NJ: SLACK, Inc.
Trombly, C.A., & Scott, A.D. (1977). Occupational therapy for physical dysfunction. Baltimore, MD: Williams & Wilkins.